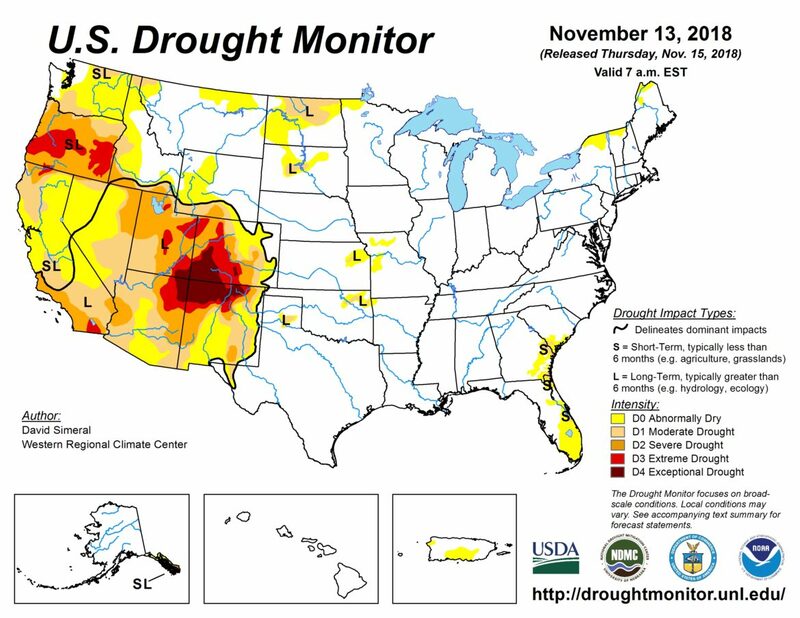 DENVER – Colorado closed out its second-driest water year on record Sept. 30, with 72 percent of the state in some level of drought. The water year, which started October 1 of 2017, was marked by abnormally high temperatures, low precipitation and some of the largest fires in Colorado history, but state climate scientists and hydrologists say the 2019 water year, which began Oct. 1, is off to a much better start. “We are trending towards the path of a good or near-average water year,” Becky Bolinger, a research associate with the Colorado Climate Center, said at a statewide water-availability task force meeting Tuesday in Denver. 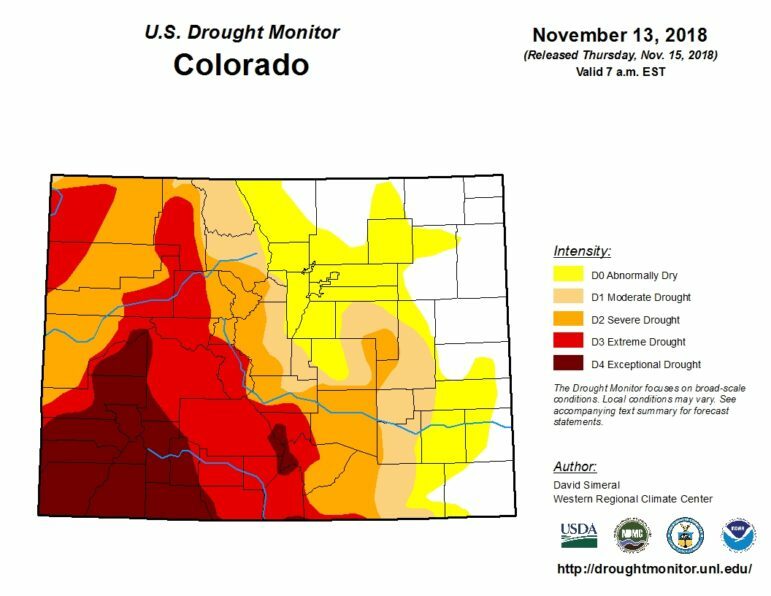 Despite a snowy fall, most of Colorado remains in some level of drought. October and the first half of November saw above-average precipitation and below-average temperatures in most of the state. While much of this precipitation along the Front Range will have little bearing on the water year as a whole, the heavy snowfall in the mountains near Grand Junction, on the Western Slope, will probably stick around until spring. Despite a good start to the 2019 water year, water managers warn that a few early snowstorms will do little to lift Colorado from its water problems. The state has been in water-shortage conditions for almost two decades. Lake Powell, the largest reservoir on the Colorado River, has dropped more than 94 feet since the year 2000 and is now 44-percent full. If the reservoir falls much further, it will be below “minimum power pool,” and water will not be able to flow through the penstocks in the upstream face of the dam down to turbines near the base of the dam. And if water levels drop even further, the surface of the reservoir will be below the level of the outlet pipes in the dam, and not enough water will be sent downstream to meet the legal obligations of the upper basin states as required by the Colorado River Compact of 1922. The threat of El Niño has also tempered water managers’ celebration about recent snowfall. Climate models show an 80 to 90 percent chance for a winter El Niño. The weather phenomenon typically causes drier weather in the northern part of North America and wetter weather in the south. Since Colorado falls in the middle of the continent, El Niño weather patterns are hard to predict for the state, but past El Niños have left most of the mountains on the Western Slope drier than normal and sent large amounts of snow to the state’s southeastern corner. Although an El Niño could be bad news for Western Slope ski resorts and limit the mountain snowpack that feeds the rest of the state, it could help alleviate drought conditions in the Four Corners region. This section of the state experienced its worst drought this year since the Dust Bowl of the 1930s. To meet summer demand, the region drew down its reservoir storage to record levels and will need a wet winter to recoup those reserves. “There’s a lot of winter to come, but that’s an encouraging start,” said Karl Wetlaufer, a hydrologist with the Natural Resources Conservation Service, which is part of the U.S. Department of Agriculture.